It's been a while since someone posted his or her configuration for others to use. I decided to do this now, even though NVil is still developing rather fast. 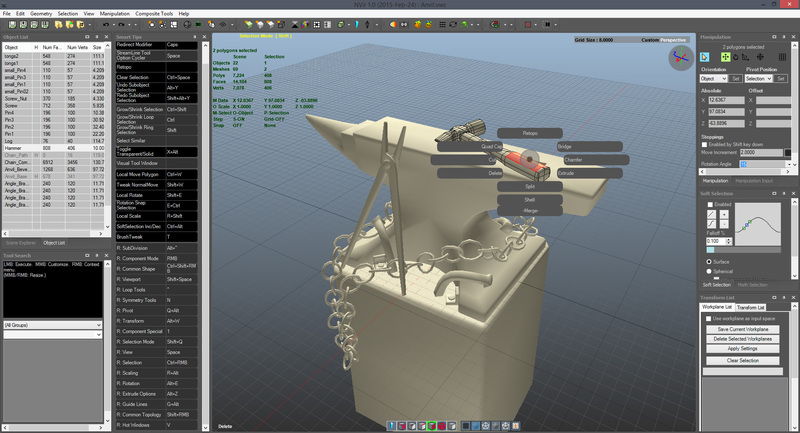 I started out with Passerby's config, because I was used to Silo and Maya. So there are a whole lot of changes to the initial startup config. Also incorporated are the user windows made by Tiles. This config heavily relies on RADIAL MENUS! But I left the shipped radial menus untouched and created my own. The base color scheme is made dark to be similar to newer Versions of Maya and Photoshop. The Smarttips are visible to help you get started with this config. There's a concept to the config, which core aspects I will try to point out now. If some keys are held down, they activate the streamline tool, but if they are tapped, they open up the visual tool. There are 3 kinds of modelling radial menus: common shape, common topology, component special. Common Shape - Here you can find commands and tools that alter the shape of an object, but not the topology, and are common to all component types. The radial menus can be kept open by just tapping the according hotkey, or they'll be only visible as long as the hotkey is pressed. In general, if you choose a tool by hovering over the entry and letting go of the radial menu's hotkey, the streamline tool gets activated. The same is true if you tap to open the radial menu and then click on an entry. But if you hold down the radial menu's hotkey, then click on and entry and let go of the hotkey, the visual tool opens. You can also open the visual tool, if there is one, by selecting an entry really fast, because it is then registered as tapped. BTW: I have renamed some of the operations! Now here are the hotkeys that are setup. The functions not listed are either in a radial menu or I thought I didn't require easy access to them. Since I have a QWERTZ (german) keyboard layout, you might need to change some hotkeys or remap the keys in NVil, especially Y and Z.
EDIT: Until I find a better permanent solution, temporary re-uploaded to above filehosters. Sticked, thanks for making good documentation for you config. Hi, I was interested in your config, both links are not working for me. Can you set up a new link? Thanks. My newest configuration is back online with minor changes as new features were introduced. Now I used dropbox instead of ever vanishing filehosters.